If morbid obesity and its fallouts have been a grave concern and you are looking for a procedure with low complication rate, then Gastric imbrication is the answer for you. It is a new weight loss technique that allows surgeons more control over how much stomach restriction is accomplished during surgery, while providing the patient with a reversible solution to obesity. The short-term results of Gastric Imbrication are promising: substantial weight loss, drastic improvement of obesity-related health problems and a low complication rate. Gastric Imbrication is a new laparoscopic procedure in which the surgeon reduces the volume of the stomach by about 60 to 70% by sewing large folds in your stomach, essentially folding it in on itself, to reduce the size of the stomach. There is no cutting, stapling, or removal of the stomach or intestines with the Gastric Imbrication. During the laparoscopic Gastric Imbrication the stomach volume is reduced about 70% which makes the stomach able to hold less and may help you eat less. The Gastric Imbrication may potentially be reversed or converted to another procedure if needed. Gastric imbrication is a restrictive procedure. It greatly reduces the size of your stomach and limits the amount of food that can be eaten at one time. It does not cause decreased absorption of nutrients or bypass your intestines. After eating a small amount of food, you will feel full very quickly and continue to feel full for several hours. 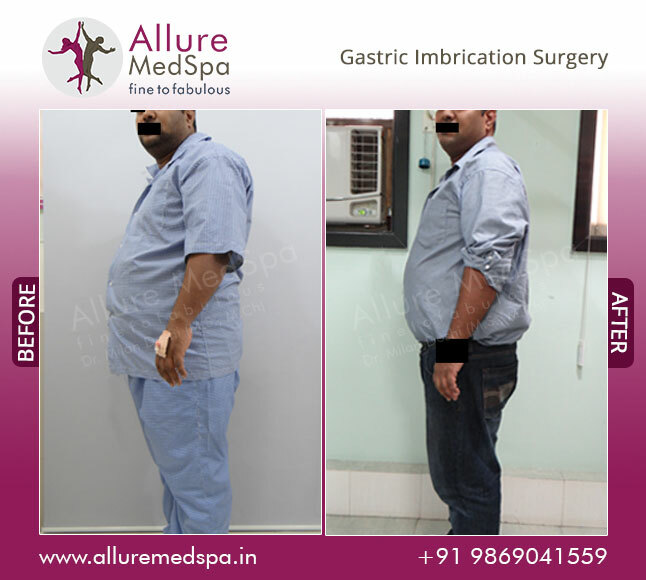 The Gastric Banding at Allure MedSpa is done using minimally invasive laparoscopic surgical methods along with the latest de-risking techniques. We endeavor to make the erstwhile perceived complex bariatric procedures doable in least time, less scarring, reduced discomfort (pain-free), and much shorter recovery time. The Gastric Imbrication procedure is done under general anesthesia. At AMS, we understand how critical anesthesia is to a surgery. Hence we have highly trained anesthetists who administer it with minutest care and ensure you have a discomfort free surgery. 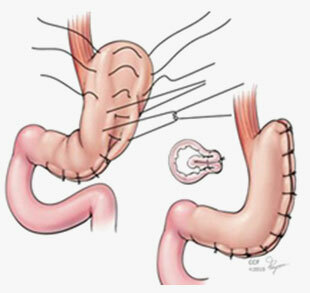 The Gastric Imbrication procedure is minimally invasive and takes approximately one hour to complete. Most patients stay in the hospital for one day after the procedure.It can be performed on an outpatient basis too for local patients. Gastric Imbrication uses laparoscopic techniques resulting in faster recovery and less scarring than open surgery. Recovery times may vary, but patients can generally return to work and normal activities within seven to 10 days. 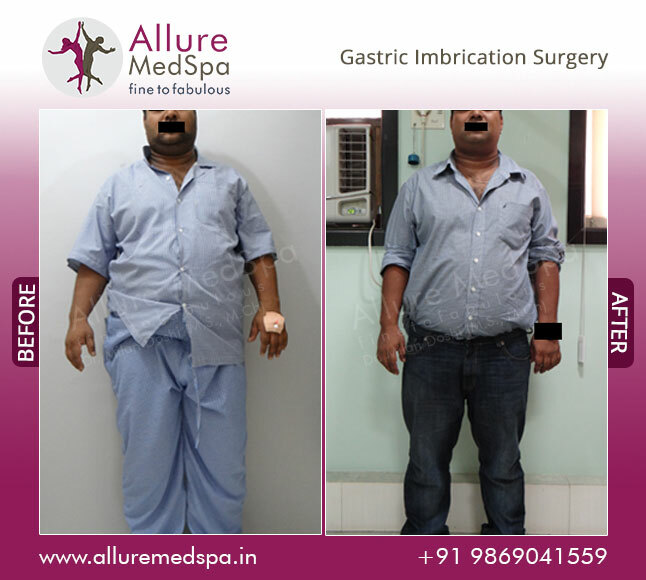 Allure MedSpa, which is renowned for its state-of-the-art internationally acclaimed services,offers affordable and cost effective bariatric procedures. To know more about the cost of your procedure request a consult by filling the form below.Your consultation is your chance to ask questions about Gastric Imbrication surgery and put your mind at rest. Your surgeon will be able to offer you full explanations and answers to all of your queries. I had a very demanding job. It required me to stay at office at nights. With success in my career, my waistline was also increasing. Finally one day while looking at my pictures, I realized that I have put on weight like crazy. I started losing my self confidence and became conscious of my image. It even started hampering my work as well as personal life. I went into a phase of depression. One day my Boss suggested me to undergo a surgery. He advised me to call Allure Medspa, where even he has undergone surgery. I took his advice and called up Allure Medspa. The staff fixed an appointment with Dr. Milan Doshi. I asked him several questions and he answered very patiently. It was a real treat talking to him. He suggested me to send my pictures so that he can evaluate my body and accordingly tag the prices. I exactly did what he said. To my amazement, the prices were quite affordable. Next day I received a reply. He suggested me to visit India. I booked the tickets and landed there. Next day I visited their center and met Dr. Doshi. It was really pleasant meeting him. He has a very polite personality and is quite friendly. I irritated him with my questions, but he answered very patiently. In a next few hours, I was ready for the Gastric Imbrication Surgery. The surgery took around an hour. After the surgery, I stayed in the hospital for a night. The very next day I was discharged. In few weeks times, I started recovering and felt the difference. It\'s been 4 months after the surgery and I have lost couple of kilos and inches from my body. My confidence have bounced back. All thanks to Dr. Doshi for this difference and of course my boss who gave me the suggestion. You will be considered for Gastric Imbrication if you have been obese (BMI of 30 or more) for several years, had serious obesity fallouts and all non-surgical weight-loss attempts have been unsuccessful. You should be willing to make significant lifestyle and dietary changes to arrest obesity. Our entire staff from to the expert team of anesthesiologists to nurses, will ensure you are treated with utmost care and warmth. Our comprehensive aftercare program focuses on your unique, individual needs. In terms of weight loss it is said that the procedure could aid in losing perhaps half of the excess body weight. The time frame to achieving this will obviously vary from person to person but most weight will be lost in the first 6-12 months. Short-term percentage of excess weight lost ranges from 30 to 55% (lower than gastric sleeve or gastric bypass; comparable to lap band), and comparable improvement to obesity-related health problems including Type 2 diabetes. The results of Gastric Imbrication depend on the aftercare regime and dietary and lifestyle changes the patient is able to stick to. 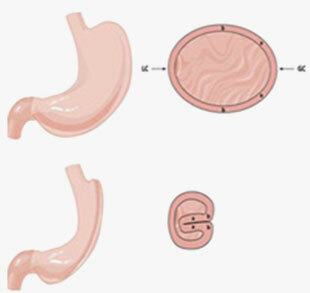 Gastric Imbrication surgery is most similar to gastric sleeve surgery in that both reduce the size of the stomach into a banana shape that connects the esophagus with the small intestines. While gastric sleeve surgery accomplishes this by removing part of the stomach and stapling the remaining part closed, Gastric Imbrication does so by folding the stomach in on itself and holding the folds in place with sutures (stitches). What is Gastric Imbrication Surgery ? The surgery is undertaken by those people who are unable to lose their excess weight under the traditional methods. It aids in quick weight loss among the patients. It is a laparoscopic procedure. Here, the stomach is folded to form a sleeve-like shape, multiple sutures are done after that to keep the stomach in the folded state. The stomach size is made smaller in the procedure. This makes you feel full for longer period restricting the intake of food. Unnecessary binging is restricted in the process. Who are the candidates who can opt for Gastric Imbrication surgery? The surgery is undertaken by overweight and obese people, who are not able to lose the weight under the traditional method. Will there be any change of diet after the surgery? You will have to meet the dietician before undertaking the surgery. The dietitian will help you to learn the techniques of healthy eating that will help you to maintain a healthy diet. A healthy diet is a must after the surgery. One should always avoid sweets and fatty food as it aids in weight gain. Is there any chance that I regain weight after the surgery? If proper diet and exercises are not undertaken, there is every possibility that you might gain weight. One should always follow a well disciplined life.